Ah, vampires, ancient, elegant, mysterious and beguiling, what amazing beings, well, bar the blood drinking, that bit is not so great. Other than that though, what’s not to love? I just had to create a Halloween project using a vampire stamp, so here it is in all its glory! The obvious colour choices for a vampire card would be deep red and black. However, I took the unconventional approach and selected typically Halloween-ish colours. That decision may or may not have been influenced by the fact, that I couldn’t find black and red papers which I liked enough for a vampire project. 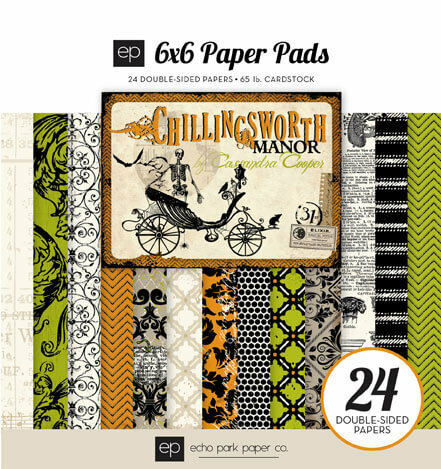 The collection I selected the papers from is Echo Park “Chillingsworth Manor”. I knew I definitely wanted to use a black pattern, so I chose a birdcage lace netting one, which is quite elegant, but eerie enough for a Halloween project. The orange paper has a damask pattern, which looks like expensive flocked wallpaper in the manors, so that one was a no brainer either and a bright green one for high contrast. Image © Echo Park Paper Co.
Once I decided on the layout I was going to use, I trimmed my patterned papers to size needed and distressed the edges using a distressing tool (scissors work perfectly well for this job too!) for that old tattered look. I then matted them on “Black Cat” Core’dinations cardstock which also had its edges distressed. 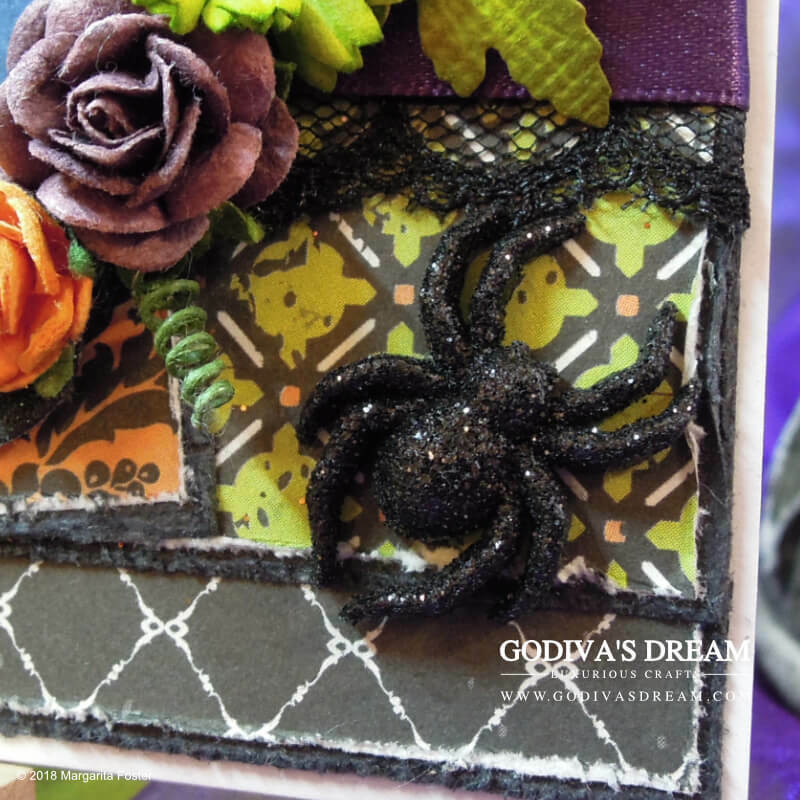 In order to give the card and elegant touch, I added some dusty purple satin ribbon and black lace. 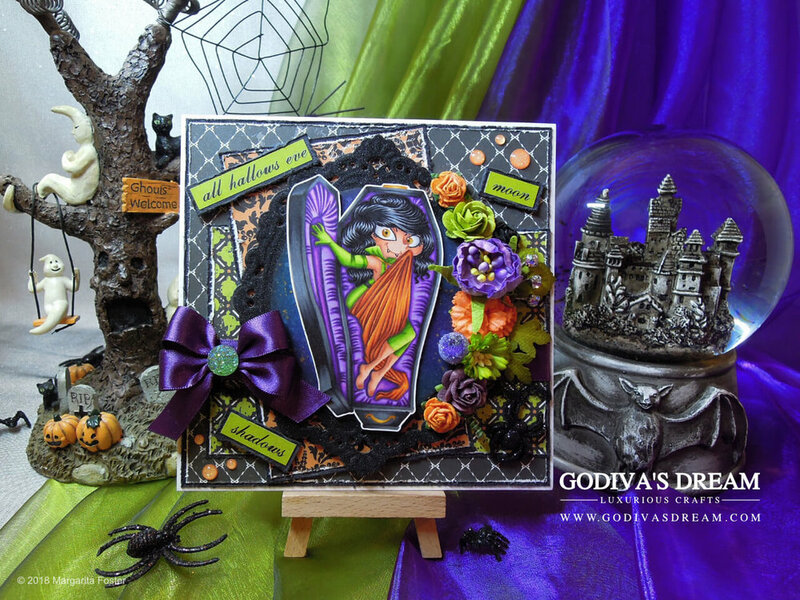 This gorgeous fun vampire lady is a stamp called “Valentina Vampire” and was created by Annie Rodrigue for Kraftin’ Kimmie Stamps. I, once again, used the no-lines colouring technique which I love. The image was stamped in Memento “Desert Sand” ink and coloured using Promarker, Brushmarker and Copic alcohol based markers. 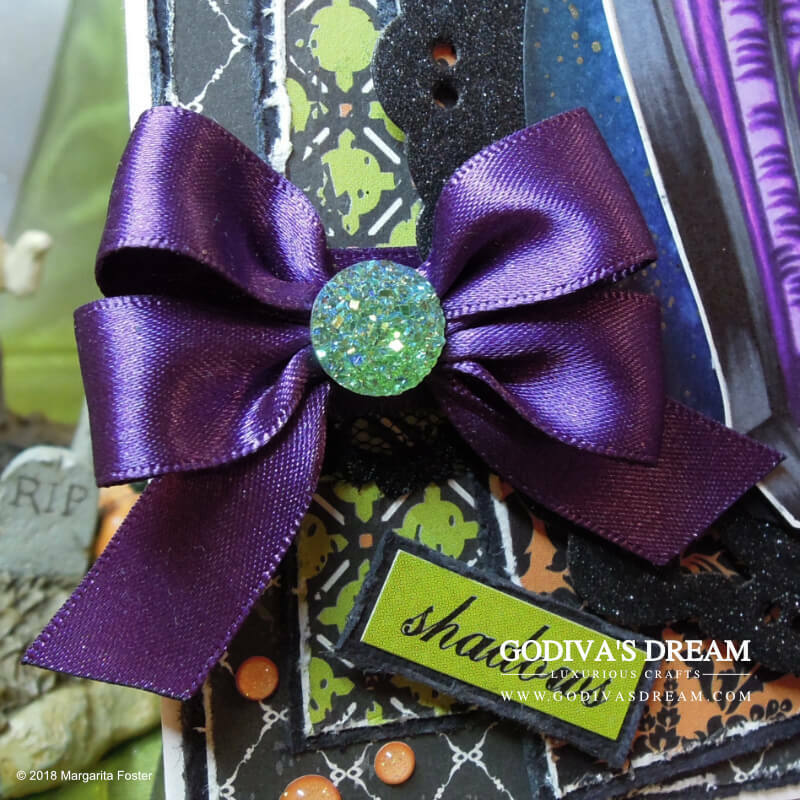 I chose the shades matching the papers and the ribbon. Once the stamp was coloured, I fussy cut it leaving a narrow white outline around it as that helps the image pop against the background. I had a pretty easy decision when it came to choosing the background for this card. We’re showcasing a vampire stamp, so a night sky couldn’t be more perfect! I blended Tim Holtz Distress Inks in “Tumbled Glass”, “Broken China”, “Peacock Feathers”, “Dusty Concord”, “Chipped Sapphire” and “Stormy Sky” then spritzed the inked area with water and gold acrylic paint to create speckles for extra interest. To display the coloured vampire stamp, I chose a striking Marianne Design frame (“Large Oval Die by Petra” LR0240) in slightly shimmery black. I didn’t want to use super sparkly glitter due to the frayed style of the card (if you look at the papers carefully, you can see that even they aren’t sharp), but subdued shimmer adds interest and helps the centrepiece to stand out. I also cut my inked background using the same die and trimmed it into an oval shape by hand, so it fitted into the middle of the frame perfectly. I slightly inked the edges with “Black Soot” Distress Ink, to darken the background and help it blend in with the shimmery black frame. I then glued the oval to the main frame and adhered the fussy cut image using 3D foam for dimension. I used the same dimensional foam to attach the whole focal piece to the card. Flowers on cards tend look classy and since we’re dealing with an elegant vampire, I believe that we cannot go wrong with some floral embellishments here. I picked a variety of flowers in differing sizes and shades to complement the colour scheme of the whole project. I also added a crystal spray, a frosted berry and some leaves (Spellbinders “Create a Rose” (S2-067) and “Create a Daisy” (S2-062) dies) to give the floral composition a more complete look. As quite customary for my cards, I tied a satin double looped bow and adhered a green sugared gem in its centre for elegance. For the very finishing touches, I chose some shimmery orange enamel dots, a glitter spider button by Dress it Up, and some Halloween related word stickers (these came from Echo Park “Arsenic and Lace” collection). I matted the words on “Black Cat” Core’dinations cardstock and distressed the edges to match the rest of the card. Are you a fan of vampires? Do you have any favourite vampire stamps? Let me know in the comments, I love reading them!